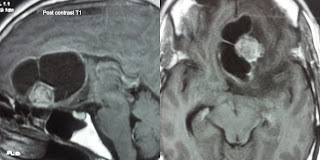 A 30 yo male with long standing progressive headache, recently worsened with vomiting. 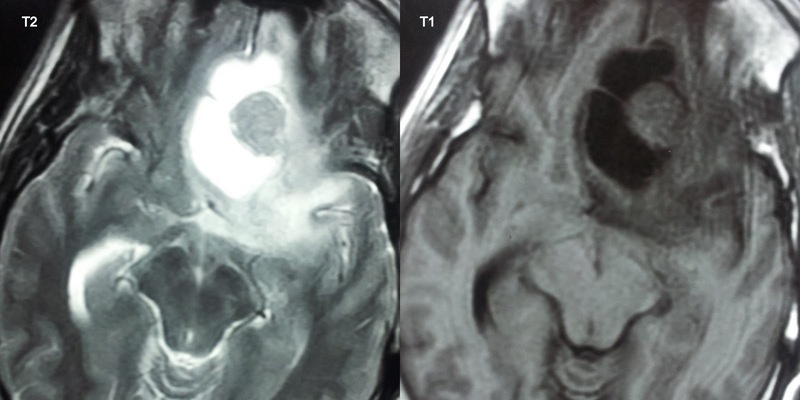 An intra axial predominantly cystic well circumscribed mass with mural nodule in left frontal lobe. Marked T2 hyper intense perilesional vasogenic odema. The fluid content of cystic component is not clear as signal supression on FLAIR is not complete. Cystic component show thin enhancing wall on post contrast T1. The mural nodule is round to ovoid, of soft tissue signal intensity with solid enhancement on post contrast T1. Contributes 5-10% of all gliomas. Most common primary brain tumor in children. More than 80% are under 20 y, Peak incidence: 5-15 years of age, Gender: M = F.
Has syndromic association with NF 1. 15% of NF 1 patients develop PAs, most commonly in optic pathway. Up to 1/3 of patients with optic pathway PAs have NF 1. 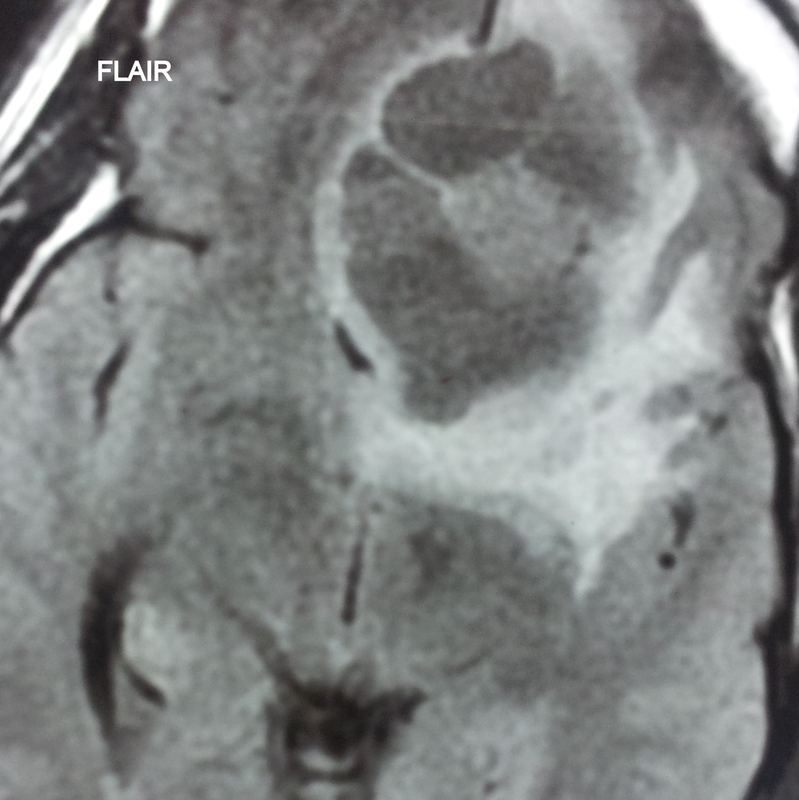 Cystic cerebellar mass with enhancing mural nodule is diagnostic clue. Overall morphology often determined by cystic Component. Cerebellum is most common (60%) > optic nerve/chiasm (25-30%) > adjacent to 3rd ventricle > brainstem. Discrete cystic /solid mass, may have little or no surrounding edema. Solid component variable density on CT and signal intensity on MRI, enhance strongly as enhancing mural nodule in more than 95%. Non enhancing cyst in ~ 50% cases. Cyst may accumulate contrast on delayed images. Associated calcification in ~ 20%, hemorrhage rare. 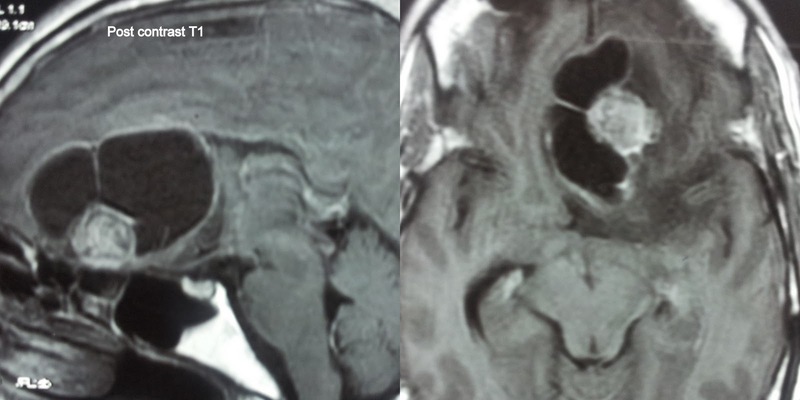 Frequently causes obstructive hydrocephalus, may be a greater clinical management problem than tumor itself. Most common signs/symptoms are Headache, nausea and vomiting, Ataxia, Cerebellar signs. Adjuvant chemotherapy or radiation only if residual, progressive, unresectable tumor. • Ca++, cysts, hemorrhage common; heterogeneous enhancement.